Susanna Hecht, professor of urban planning at the UCLA Luskin School of Public Affairs, was recently awarded the prestigious David Livingstone Centenary Medal by the American Geographical Society. Hecht is a geographer who also holds appointments in UCLA’s Institute of the Environment and Sustainability, and the UCLA Department of Geography. 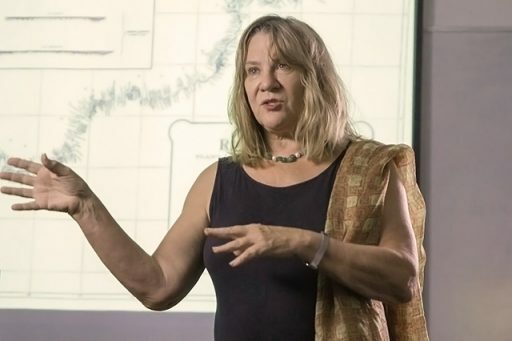 She was honored by the institution, established in 1851, for her nearly three decades of pioneering research focused on land use change in the tropics, primarily in the Amazon rain forest. “Dr. Hecht is widely recognized as a preeminent authority on forest transitions and sustainable agriculture,” according to an AGS press release. “She is one of the founding thinkers of the field of political ecology, which integrates humanities, policy and social justice in its approach to issues.” The organization also noted Hecht’s “sophisticated comprehension of deforestation” and how it interacts with migration, the ecosystem and the possibilities of alternative economies. Hecht, who is also professor of international history at the Graduate Institute of International and Developmental Studies in Geneva, is the author of a number of books on the Amazon. Her 2013 work, “The Scramble for the Amazon and the Lost Paradise of Euclides da Cunha,” won the 2015 American Historical Association’s Best Book in Environmental History Award. “Susanna’s work on the Amazon exemplifies geography’s contributions to changing tropical conditions. She understands how economics, culture and land use operate in a society to reflect and change the environment,” said Deborah Popper, AGS vice president and chair of the Honors and Exploration Committee, which bestowed the award. Susanna Hecht is part of a group of 50 University of California scholars and scientists addressing the 10-campus Carbon Neutrality Initiative. For Urban Planning professor Susanna Hecht, the future of life on this planet as we know it is a matter of degrees — a scant few at that. Hecht is part of a group of 50 University of California scholars and scientists addressing the 10-campus Carbon Neutrality Initiative proposed by UC President Janet Napolitano in 2013. Under this initiative, the University of California aspires to become carbon neutral by 2025. Recent California legislation also calls for a marked increase in the amount of renewable resources providing electricity in California by 2030. Hecht and her UC colleagues, led by Veerabhadran Ramanathan (renowned climate scientist from the Scripps Institution of Oceanography), are among those who want to “bend the curve,” or the “hockey stick” graph as Hecht refers to it, on the rise in global temperatures caused by greenhouse gases. A mere two-degree change in average temperature will portend future disaster from drought to sea-level rise, and changing weather patterns that most of the globe is not prepared for, according to experts representing a wide range of disciplines. The group of UC scholars, from fields as diverse as ethics and environmental justice to climate science and religion, met in October at the University of California’s Summit on Pathways to Carbon and Climate Neutrality: California and the World, led by California Governor Jerry Brown. The purpose of the meeting was to focus on solutions that could guide the state but also to provide solutions that could be used worldwide. UC research and recommendations were also part of the 2015 United Nations Climate Change Conference held in Paris. In addition to carbon (which has a long life in the atmosphere), Hecht points out the many other factors that contribute to temperature rise, such as methane and HFCs (hydrofluorocarbons) released into the environment, as well as the “heat island” effect our built environment, roads and urban centers create. As a “carbon sink,” the tropical rainforest absorbs millions of tons of carbon from the atmosphere, and Hecht points out that deforestation of the Amazon has dropped significantly in the last decade. This has had an impact, but the rainforest can’t do it alone, especially when deforestation continues in other parts of the world such as Indonesia. Professor of Urban Planning Susanna Hecht is part of a team of 50 UC researchers and scientists who authored a report on climate change released Oct. 27. Susanna Hecht Wins Award for Best Book on Latin American Environmental History Award granted for research in the social and political history of the Amazon basin. Dr. Susanna Hecht, professor of Urban Planning, has been honored as the winner of this year’s Elinor Melville Prize for the best book on Latin American Environmental History. The Elinor Melville Prize, established in 2007, is a competitive award for the best book in English, French, Spanish or Portuguese published during the previous year on the “study of the mutual influences of social and natural processes in Latin America” and its scholarly contribution by the Conference on Latin American History. 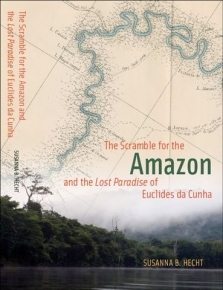 Hecht’s book, The Scramble for the Amazon and the Lost Paradise of Euclides da Cunha, tells the story of the vast exploitation of the Amazon basin by the nineteenth century’s imperial and industrial powers for its rubber, the journey of one of Brazil’s most accomplished writers to unveil the inner workings of the exploitation along the way and the complex social, political and environmental history of the Amazon. Dr. Hecht’s research has focused on political ecology and her results have had major implications for climate change adaptation, mitigation and longer term rethinking of longer-term resilience strategies. She has also been funded by the NSF, NASA, MacArthur Foundation, ACLS Guggenheim and the Institute for Advanced studies among many other sources. Learning can come in many forms, including class lectures, discussions and research, but the first Global Public Affairs salon aimed to combine these forms into one engaging multi-departmental, student-faculty discussion. 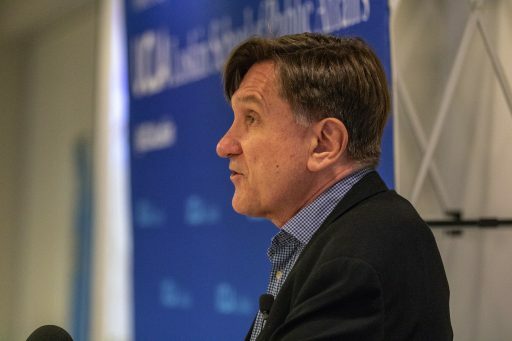 Put together by Urban Planning professors Michael Storper and Steve Commins, this salon created a space for students and faculty from widely varied backgrounds in Public Policy to discuss major global public affairs topics outside of the traditional lecture setting. Once the debate commenced, students brought up points to defend or deconstruct each myth while faculty expanded on those ideas with information based on their own research and experience. Comments ranged from analysis of developmental markers to benefits of quantitative vs. qualitative data to dealing with corruption and misuse of foreign aid. 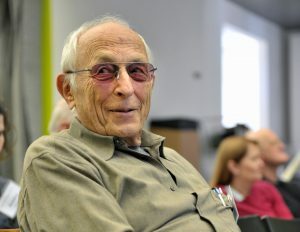 Professor Michael Storper led the discussion, emphasizing at the beginning that the goal of the salon was to take information learned in the classroom and apply it to engaging, intellectual debates. 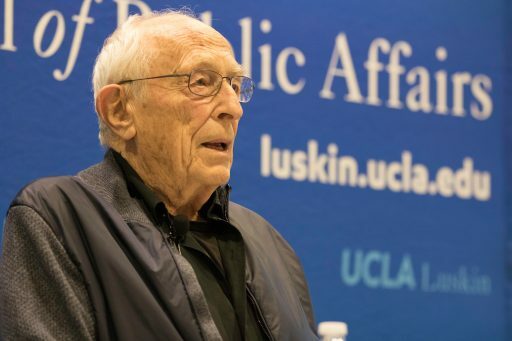 Other Luskin faculty members that participated included Steve Commins, Manisha Shah, Robert Schilling, Paavo Monkkonen and Susanna Hecht. Urban Planning professor Susanna Hecht has published a new book. “The Social Lives of Forests,” co-edited by Hecht, Kathleen D. Morrison of the University of Chicago and Christine Padoch of the Center for International Forestry Research in Indonesia, will be released in early March. “Forests are in decline, and the threats these outposts of nature face—including deforestation, degradation, and fragmentation—are the result of human culture. Or are they? This volume calls these assumptions into question, revealing forests’ past, present, and future conditions to be the joint products of a host of natural and cultural forces. Moreover, in many cases the coalescence of these forces—from local ecologies to competing knowledge systems—has masked a significant contemporary trend of woodland resurgence, even in the forests of the tropics. The book is published by the University of Chicago Press.